The only reason I’m angry about this bottle—aside from the price—is how many respected reviews it’s received. It’s like when you buy a quality garment from a reputable house and it splits at the seams on first wear. LVP pretends to produce wines that are much better than they really are. Or so I think. Drink them back to back with half a dozen other BC wines and I think you’ll see my point. They make OK wines gussied up a bit with facsimiles of hand-crafted labels including tech specs in script and, for better or worse, a price tag that puts them in the upper echelon of the local crop. Witness this Rhone blend which is sharp, minerally, lightly herbacious and a touch acid. It’s spectacularly aperitif friendly but not terribly memorable or evocative and has nothing that we were anticipating (orange blossoms, honeyed fruit, etc.). I would like to witness some con-no-sirs blind taste this and see if it scored so high against the real McCoy. (I mean one review described it as having a note of “baked brioche” of all things; it’s that sort of crap that drives people to Yellow Tail.) Oh, and 14 point effing three per cent alcohol: That’s patently anti-French! Price: A preposterous $35 from the vineyard. 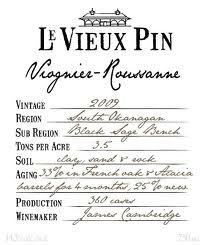 Pete’s in Seattle recently sold a Wine Advocate 93 pointer from the actual Rhone valley for $18.69 a bottle. Now that’s something to write a review about.